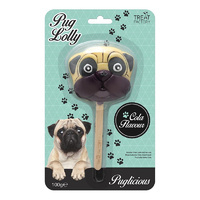 Pug Lolly | Sink your teeth into this! A fun gift for anyone partial to pugs! 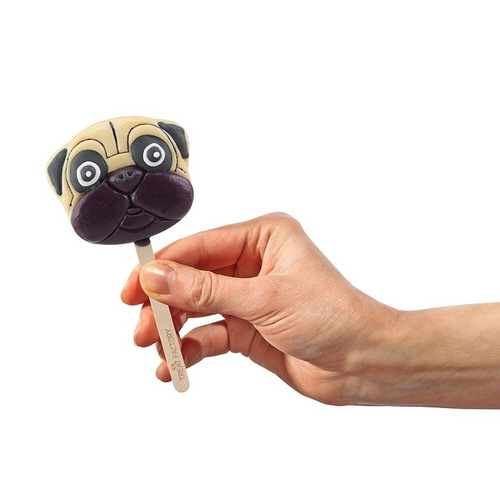 A treat for dog lovers with a sweet tooth! With big puppy dog eyes, tiny ears and adorable pug features, this Pug Lolly is a quirky gift for any celebration! It's time to devour this pup with the same enthusiasm as a pug, jumping up to lick you all over! It's a gorgeous treat that will leave you in stitches when you find it peeping out of your lolly bag or Christmas stocking. He not only looks sweet but tastes delicious too as you sink your teeth into the fantastically sweet cola treat. 100g. Measures 14cm in height (including stick).